First off, I'd like to say that this book has a beautiful cover! Yes, it has a girl (like almost every other YA novel), but what I really like are the stars, and the fonts. They work so well together, and that's what drew me to the novel in the first place. What really made Timeless stand out, however, was the time travel. I loved how Michele got to continuously travel back and forth between the past and the present, and that rather than just go back to 1910, she got to visit other time periods as well, such as the roaring 20's and World War II. You can tell that the author really did her research, as everything felt as though it really could have happened. Ms. Monir even added an appendix to the end of the novel where she recommended books, movies, and musicians! I love when authors do that, because if I like a book enough it's fun to check those out. I will say this - Timeless didn't stand out as something epic, and it was a quick read that did seem a little like fluff in some moments (how could you fall in love with someone that quickly? ), but I enjoyed reading it. The heroine, Michele, was pretty likable, and so were her ancestors, Clara and Lily. The love interest, Philip, seemed sweet, but he had been engaged for pete's sake! And he showed feelings for her the first time they met! I did try to keep in mind that Michele had been dreaming about him her whole life before she met him, and he had some sort of indescribable connection to her himself. Plus he didn't even like his fiancee, let alone love her (don't worry, she was a b****). 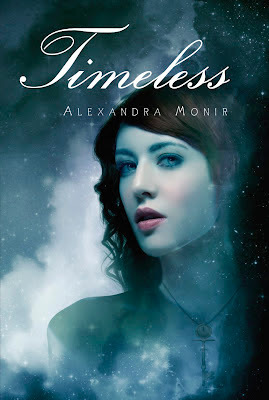 At any rate, I can easily say that Alexandra Monir certainly knows how to tell a story, and I am eagerly awaiting to read to sequel, Timekeeper, which is expected to be released on December 26th. The cool thing is there's already a short story out in ebook form called Secrets of the Time Society, which is can be read in-between the two books. I will definitely be checking that out! One more cool bonus that I feel I must mention - Alexandra Monir is also a singer/songwriter, and there are a couple songs in the novel which she actually released as a single on iTunes! I wouldn't have known that without checking out her website. It was bugging me not to know how those songs would sound like, but it seems Ms. Monir was one step ahead of me! Those songs were really good, and I couldn't resist purchasing them for my iPod. Definitely check out Timeless if time travel and romance interest you!